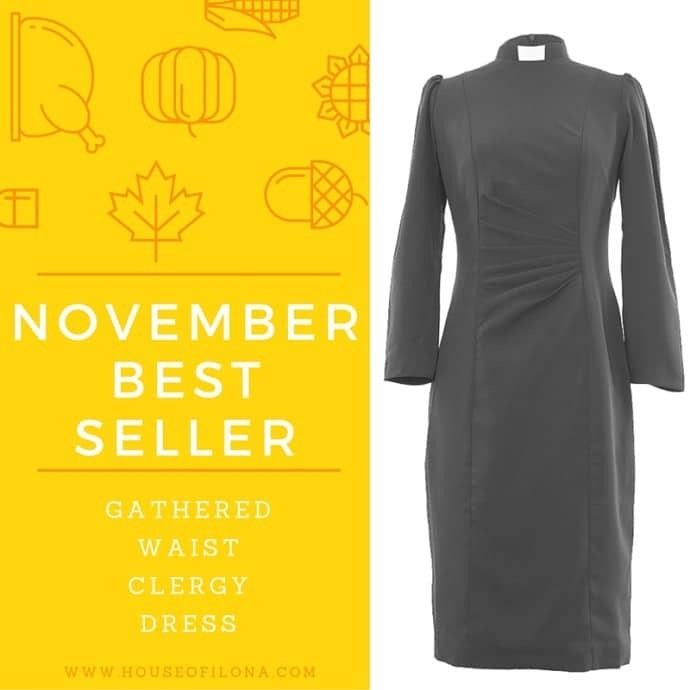 The best seller of November 2015 was BY FAR the Gathered Waist Clergy Dress. As we like to say with this dress, it does what it says on the tin. It gathers in the waist for great style and subtle detailing on the shoulder sets this Clergy Dress in a league of it’s own! “Having cried in the face of ill-fitting clergy shirts I felt that heaven on earth had come when I put on this dress. I was back! No longer condemned to a life in men’s clothing; this dress is an absolute must if you wish to retain your sense of femininity whilst still looking as required! “I love my gathered waist clergy dress. I feel professional, polished, and beautiful when I wear it. I wore it for my ordination and received so many compliments on it. It gives me a waist…Love that!!! The fit is fabulous and I am wanting to order another one… I have recommended House of Ilona to many of my clergy friends. I am so glad I took the risk to order on line…It was scarey —but the return was super. “I just love the dress! It fits perfectly, is comfortable and looks absolutely stunning! I couldn’t imagine a clergy dress could be so adorable! Very fast delivery to Sweden, I placed the order Friday, and it arrived Monday morning at my door. Thank you so much House of Ilona. As always, it’s an honor to serve YOU! This entry was posted in Blog and tagged @houseofilona, clergy dress. gathered waist clergy dress, elegant and modest.